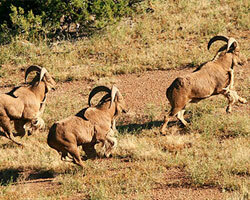 Hunting on the o6 Ranch is for the serious hunter interested in pursuing trophy animals over rugged terrain. The area hunted is mostly unfenced, open pastures in rolling plains, rugged mountains, and deep canyon with no high fencing. The species hunted include Desert Mule Deer, White Tail Deer, Rocky Mountain Elk, Aoudad, Collared Peccary, Rio Grande Turkey, and Feral Hog. Other game animals may be available although Pronghorn are currently protected. 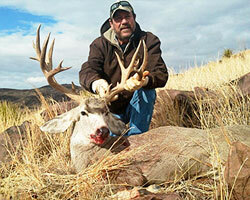 Typical Hunt: An o6 Ranch hunt is generally conducted over two to five days. Hunters generally arrive at the hunting camp during the evening prior to the first day of hunting and depart during the afternoon or evening on the last day of hunting although some may spend one more night. Guides will be provided for all hunts. Number of Hunters: From 2 to 28 hunters can be accommodated with each guide escorting from 2 to 4 hunters. Non-Hunter Guests: For a modest charge non-hunter guests accompanying hunters are welcome based upon space availability. Lodging & Meals: The fees for hunting the four main species include lodging at the o6 Ranch hunting camp which is located just west of State Rt. 118 about half-way between the towns of Alpine and Fort Davis. The hunting camp consists of three bunk houses (one with a dining/club room) and a cooking shed. The bunk houses provide accommodations for up to 28 hunters and 7 guides. Meals are provided upon arrangement. They are generally prepared and served chuck wagon style by the ranch cook. Meals will generally not be provided unless at least 4 hunters and guests are in camp although hunters may prepare their own meals at the hunting camp or access restaurants in Alpine or Fort Davis. Alcoholic beverages are not provided. Equipment and Supplies: Hunters will supply their own firearms, ammunition, and other hunting supplies. Both hunters and guests will supply sleeping bags and appropriate outdoor clothing. Texas Hunting License: Hunters must have a current resident or non-resident Texas hunting license valid for the animals being hunted. Note: Texas offers many types of licenses and for some animals non-residents may acquire a license at a reduced cost. Transportation: Transportation during the daily hunts is included and is provided by pickup truck or all-terrain vehicles. The nearest commercial airports are Midland International Airport (MAF), which is about 190 miles to the northeast, or El Paso International Airport (ELP), which is about 210 miles to the west. Both airports have full car rental facilities. Alpine-Casparis Municipal Airport (E38), located just north of Alpine, Texas, is a public-use general aviation facility. Transportation to the o6 Ranch hunting camp is not provided except to and from Alpine-Casparis Municipal Airport. Want more information? If we can assist you with learning more about our hunting opportunities please contact our hunting manager Lance Lacy at brandee@gvtc.com. Information on the cost of the various hunting activities, payment arrangements, and suggested gratuities for hunting guides and cook staff are provided upon request.